The Thermo Pond heater is a must-have for the winter season. This floating heater will keep a small area ice-free so that toxic gases can escape, thus keeping your fish safe and healthy all winter long. This heater will not burn or harm your pond liner in any way and uses 10 to 15 times less power than comparable heaters. Get your pond ready for the winter with the Thermo Pond heater.Size:12" diameter, 4" high. I bought one of these a few years ago, didn't last the winter, got another one via the warranty and that one broke even faster than the first. Do yourself a favor and spend the extra dollars for a better heater. 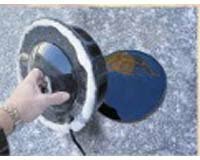 Last year (My 1st pond winter)I had bought a 200 watt ( considerably more expensive)De-icer thinking that size and cost was better. I bought this 100 watt unit on a lark, simply as a backup unit. Needless to say the more powerful unit failed within a month (sank to the bottom) and this thrifty unit just kept plugging away. Our Chicago land weather reached much to close to -20 degrees (Where I live is border line between zone 4 & 5) and This de-icer did just what it was suppose to do, Keep a hole in the ice so my fish stayed alive. Just getting ready to order another unit (perhaps 2 just in case some of the other reviews are correct). At the cost and my past experience I cannot find anything but positive things to say about this product. I don't know of anything better. There are not many choices for a product like this. 100 watts is pretty economical to operate. It works good down to 25F but any lower and it cannot keep the water from freezing. More power should work at a lower temperature but cost more to run. I placed it in my pond 10 days ago, which had iced over. It took some time but melted through. Here in Maine, at night the temps have been in the teens and twenties to date. Daytime has been no higher than 35 mid day. This 100W pond heater is designed to keep the pond from completely freezing over for a long period of time. We have not had a real bad freeze here in southeast Pennsylvania and thus have not installed the heater. This is a complete waste of money. I bought one, used it for one season, and it froze solid into the ice. I had to spend four hours melting a hole with hot water and salt so I could use my old inefficient but dependable heater. I called the manufacturer who told me to cut off the plug and mail it in. I did, and I was sent a new heater.